All Planet Soap soaps are made by hand using the traditional cold process method. This retains all the skin nourishing goodness of the natural ingredients. 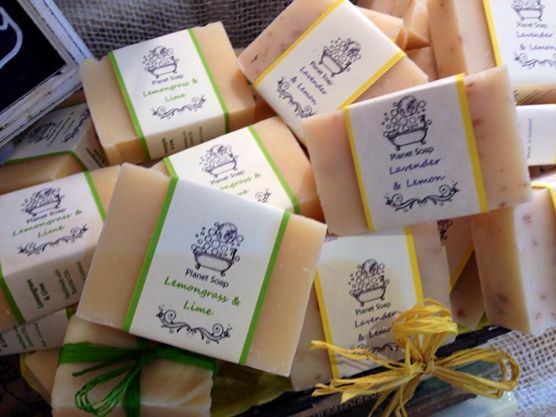 The soaps are olive oil based and vegan friendly. They are attractively labelled making the perfect gift or treat. Essential Oil Soaps Planet Soap makes amazing fragrant, luxurious soaps using a carefully chosen range of pure essential oils. The delicious scent lasts all through the bar, and the soap is surprisingly long-lasting and gentle. Nettle Soap Planet Soap makes an excellent nettle soap, very popular with people with skin prone to psoriasis and eczema, or sensitive or itchy skin in general. Also popular with men who enjoy a wet shave, and anyone who enjoys a great natural soap without added fragrance. Planet Soap Bath Bombs enriched with moisturizing Shea Butter in a range of gorgeous essential oil blend scents. These fizzing delights soften and scent the bathwater leaving the skin feeling silky smooth and pampered. Planet Soap Natural Dog Soap - a great cleansing shampoo bar for your canine friends, Leaves their coats fresh and shiny and their skin comfy. Convenient for spot-washing or a full bath, and economical - it lasts for ages! See the full Planet Soap range on the Products page. Corporate Gifts or Wedding Favours For stunning, handmade wedding favours, or special gifts Contact Us with your requirements. Hotels and B&Bs Give your guests an extra special treat from a selection of beautiful guest soaps. Contact Us for more details. Like us on Facebook Keep up with news and offers via the Planet Soap Facebook page. Please see shipping page for new postage rates.